Since no one person can be a true specialist in all of the many planning areas that today's affluent families require, our firm will work with your team of professionals. In areas such areas as estate planning, accounting, insurance, charitable giving, real estate, and more. A wide range of advanced planning needs requires an equally diverse team of experts. 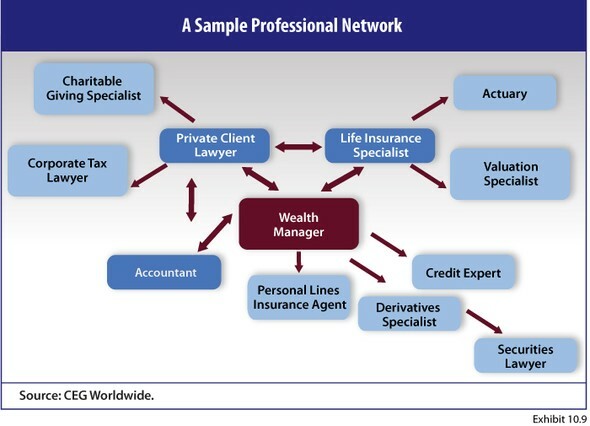 Our role as your wealth manager is not to provide these services, but to work with your trusted team of professionals to help implement your wealth management needs and goals. We can serve as the “hub” for your financial life, working with your team of specialists in many diverse areas to help solve your complex financial issues. Note: Riviera Wealth Management does not provide tax and/or legal advice. Professional services as those listed above are provided by your individual consultants, or working in collaboration with them. Please consult your own tax, legal, insurance or other advisors for your specific needs. Riviera Wealth Management does not endorse any referrals and therefore gives no assurances as to the quality of their services.